I got the word over the weekend…probably about the time you did. Dr. Keith Baird, Class of 1956, Space pioneer as a flight doc, Wabash legend, Wabash sports fan, has passed away. “Doc” Baird was a special man in several ways. Let me give you the Grunge take. As a fighter pilot, doctors are your worst enemy. Heck, when your health is perfect, like it always is until something goes really wrong, the only thing a flight surgeon can do is ground you. Pure and simple. Keep them happy…at a distance. Dr. Baird became my “flight surgeon in residence in Indiana” doc. If I had something I needed to get taken care of while back here, I always went to see Doc Baird. Typical appointment went something like this – 3 minutes on medical, 7 minutes on Wabash, 20 minutes on flying and space. Little to no variance. I didn’t know him when I was here…I got to know him, by legendary reputation, through family. When I returned to Wabash, Doc was a regular as sporting events. In fact, last fall, despite some breathing challenges, he often made the trip to away games…solo. Well, sort of solo…Doc Baird and one of the Porsches. He was a fixture on the sidelines…always positive, always cheering for our men. Same for other sports. He loved aviation – so the bond between us was strong. He loved Wabash…and counted this good place as a cornerstone of his entire personal and professional lives. 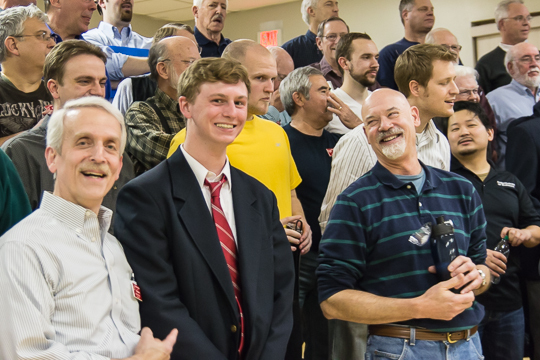 He touched the lives, and the souls, of countless Wabash men. Doc – keep the pointy end forward and your speed up. Keith Baird – Some Space Pioneer, Some Flight Surgeon, and Some Little Giant! AJ is one great young man. We seem to always catch up as he’s headed to class or I’m headed to a meeting. He’s one of our students working in Career Services. Check out this very short video… No, I’m not going to tell you anything about it – after all, it’s only 82 seconds. AJ Clark – Some Little Giant! 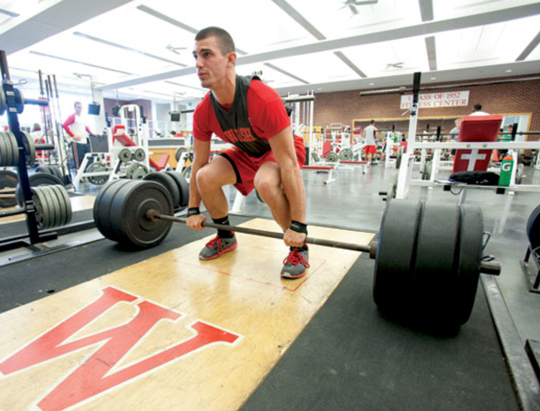 The magazine MensHealth recently listed the best (coolest) collegiate fitness centers. As you can imagine, there are some really well known schools listed…and only one Division III school. Can you imagine…a Division III college in a group that sounds like the biggest and baddest of Division 1 athletic programs? Yes, some place called Wabash. How cool is that? Here’s the link. Took this photo during the Glee Club Spring Break Trip of 2014. All that’s left of “Wabash” is “H”. Made me think, just like the pots worn by the Sphinx Club pledges make me think…how many Wabash men have used that book? This is the Grunge’s first foray into a video. I know – it isn’t that good. However, the subject matter more than makes up for my somewhat lacking video skills. OK – really lacking video skills. We had a great time that night at Dressel’s pub – our alumni really appreciated the guys stopping by to have a meal with them. Kip Chase ’03, who is now in China in a leadership role for Eli Lilly, provides this report. Writing to share some highlights from the first ever W Night in Shanghai. Attached is our group photo…we had a great turnout and had Wallies join us from Indianapolis, Crawfordsville, Hong Kong, Beijing and Shanghai. We even had a recruit from Nanjing. It was global, exciting and fun…and in typical Wabash fashion we ended with a night cap sitting outside surrounded by 100 year old buildings and 100 story skyscrapers. I’d share there is a lot of energy to help recruit future students from the group that attended…definitely let us know how we can engage and help over here. Prospective Student – Meng Fen and his family. It was a night of stories, laughs and smiles. Hope everyone is well back on campus. 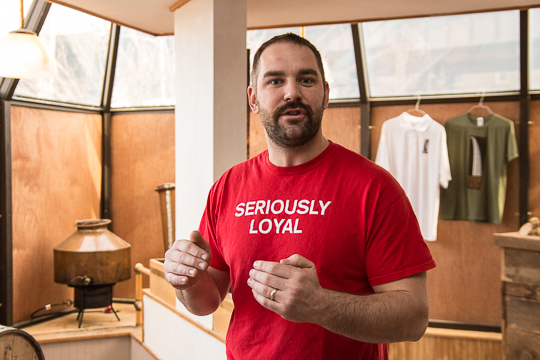 Dave Weglarz ’03 absolutely loves what he’s doing. Love is NOT too strong a word. His excitement and enthusiasm gushes from every pore. The Grunge got a chance to see him in action at Still 630. It’s still small – but sales and inventory are growing. It’s still a one man operation – but his family, including bride and new son – are all in. 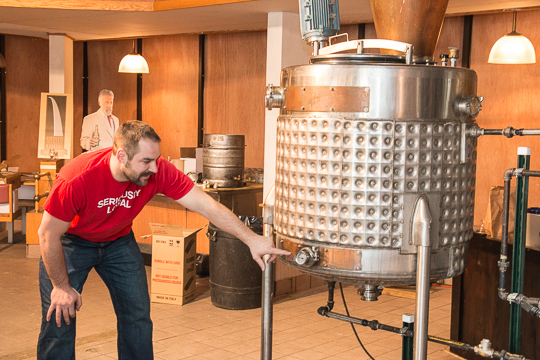 He’s perfected the Rye Whiskey…and is already working on a couple of new products. Dave walked me through the process. He knows this business inside and out. He always knew he wanted to own his own business. He wasn’t sure what it would be…but I think he is on to something. I know what going to work with a smile on your face looks like (all fighter pilots do!) and he has that look! In a true Wabash man, he has done his homework. He learned the chemistry part…and the cleaning out the vats part. He can explain why the wooden barrels he uses are the best there are. And he knows how to distinguish a good batch from a great batch. He is exactly what you would expect if you looked up Wabash entrepreneur in your Funk and Wagnalls. English major….with serious chem skills. RallyPoint Rye Whiskey. Seriously good. New things coming. 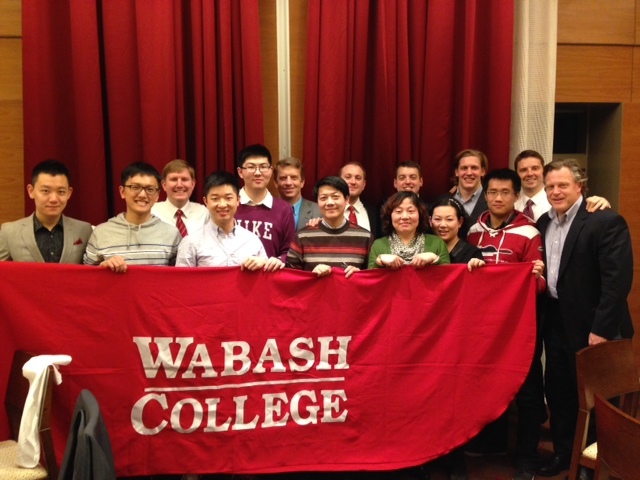 Wabash through and through. The Grunge has tagged along with the Glee Club tour in St. Louis. 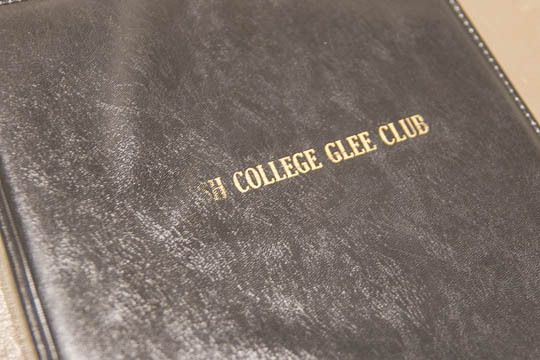 Our local, very active, regional group will join the Glee Club for a dinner marking the end of their spring break tour. From all I’ve heard, it’s been a good tour. I joined them last night because I had heard that the Ambassadors of Harmony were very good and it might be interesting to see the two groups together. We’ll it was just like the Grand Canyon hikes I’ve been a part of – strangers for a few nano-seconds then everyone just fits right in. Same here. 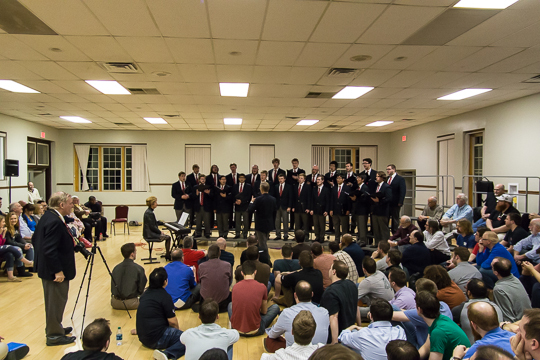 A two-hour, full-motion, hit-every-note-right practice gave way to a short Glee Club performance. It was fun. The Ambassadors enjoyed the Club and our guys really clicked with them. We had 22 members of the Glee Club and they had about 130 members at practice. But numbers didn’t matter – all that really mattered was a love of singing and there was plenty to go around. 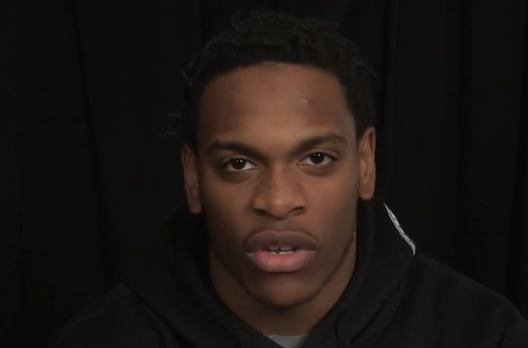 So…our guys start spring break tomorrow. They’ll be scattered all over…some on immersion trips, some with spring sports trips, and some to Florida, Texas, and other warm spots, immersing themselves in…ahh…rest and relaxation. 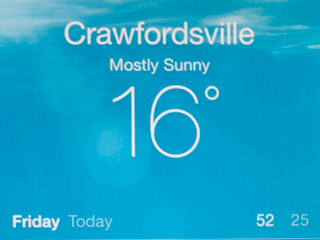 The C’ville weather, though, has kept them pretty much in winter mode – witness the temperature this morning. No time to think about the mind and body slipping away when the temperature, at least to start the day, is in the teens. 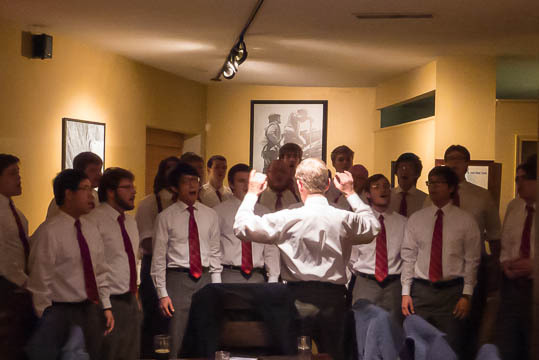 I’ll try to catch the Glee Club on the final few stops of their spring break tour next week. We’ll enjoy the relative peace and quiet through about Tuesday afternoon…then we’ll look forward to the guys returning that weekend. It’s always that way. Meanwhile, you’re best bet to follow spring break is through our many blogs. Here’s the link. Enjoy. Jacob Pactor ’04 is a really good teacher – I’ve told you that before. I know that because I’ve seen him in action. 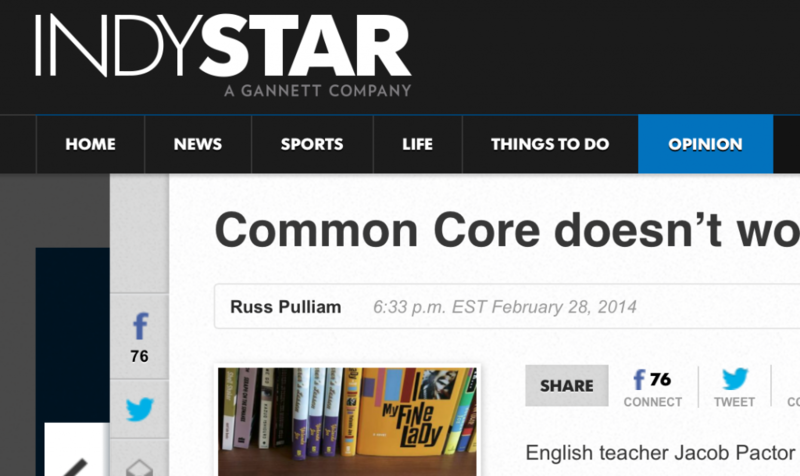 Read this short article fr0m the Indianapolis Star about Jacob’s approach to teaching. It will make you remember…and smile.